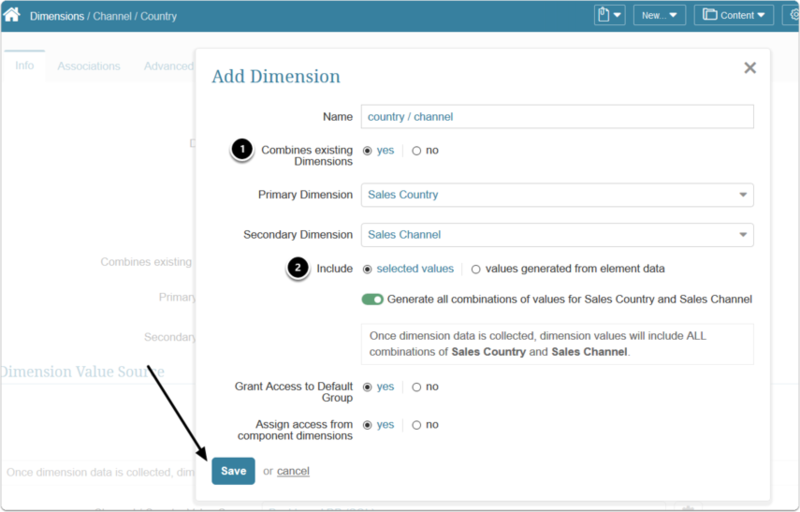 A Compound Dimension is created by combining all or selected Dimension Values from two existing Dimensions. A Metric and Report may be Dimensioned using a Compound Dimension that results in one instance of the element for each combination of Dimension Values fetched in a ResultSet. When creating a new Compound Dimension, one of the Dimensions is designated as the Primary and the other as the Secondary Dimension. Only 'bulk loading', that is, automatically collecting all values with one query, is supported. 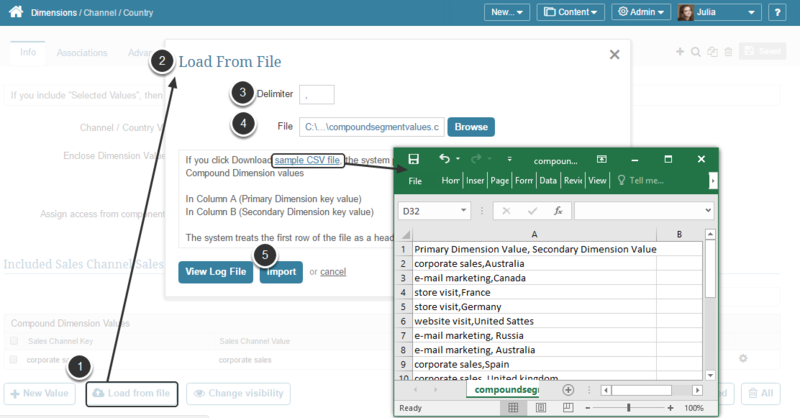 As with any Dimensions, Dimension Values may also be entered manually or uploaded from a CSV file. Add Dimension pop-up screen layout will appear as below after you set Combines existing Dimensions to Yes. 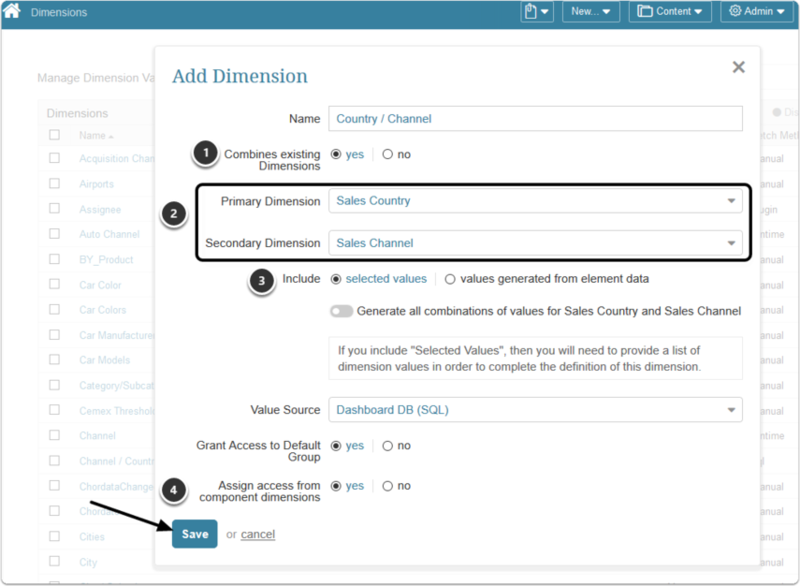 Include: Define how Dimension Values are to be populated. values generated from element data: This solution allows creating Dimension Values "on the fly" as elements using this Dimension are run. This generates the list of Dimension Values based on the combinations of the two Dimensions that have actual data. selected values: control what compound values are added to this Dimension. If you choose "Selected Values", provide a list of Dimension Values in order to complete this Dimension. 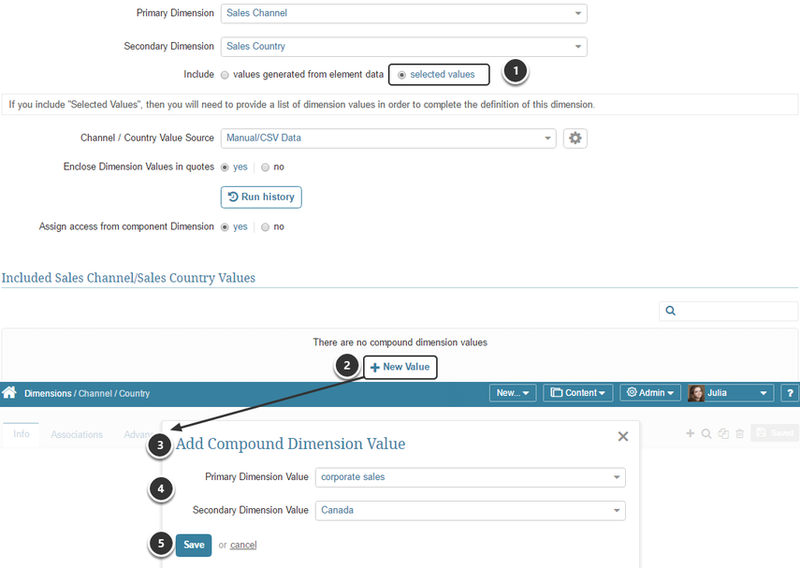 In later versions, you can select to have the system create the Compound Dimension values based on all combinations the existing Dimensions. 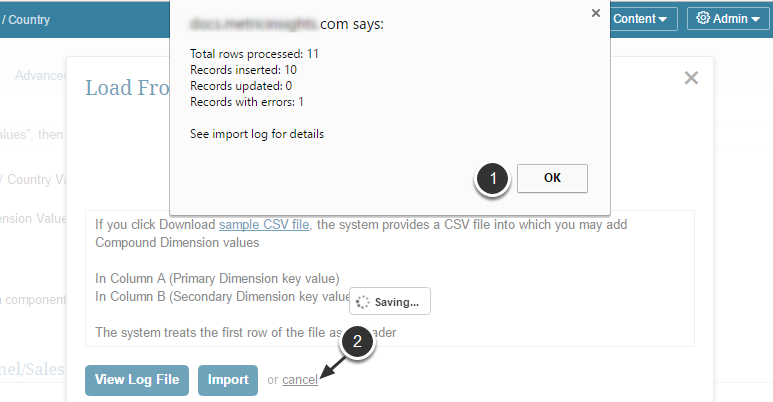 You can keep adding values one-by-one or upload them as a CSV file (see below). NOTE: If you want to enter values via a CSV file and you are unsure about its format, click sample CSV file link to obtain a file, save it and enter data into the spreadsheet. 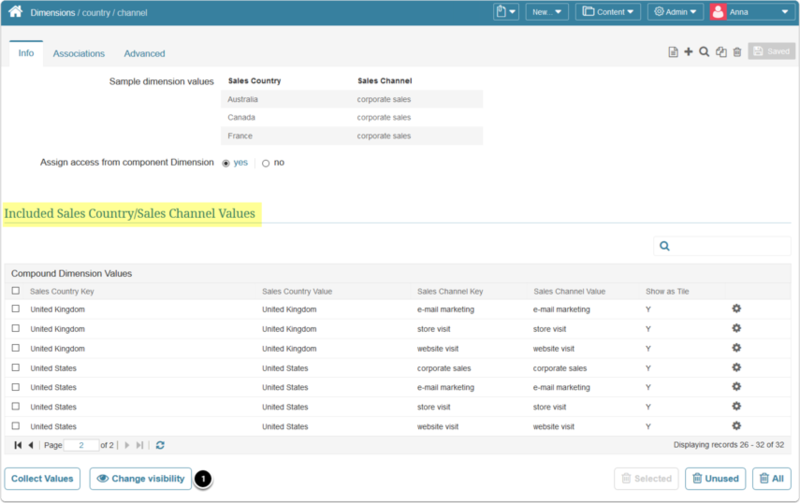 All the successfully processed values are added to the Compound Dimension Values table. Create a Dimensioned element using the Compound Dimension. 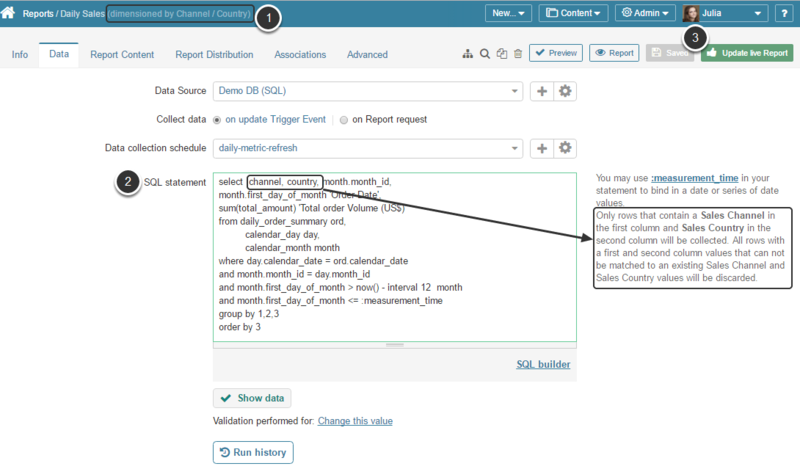 See Creating Dimensioned Metrics and Reports for more instructions. Fetch the data for your element. In the given example we use a SQL database as a Data Source, so we need to construct a SQL statement. 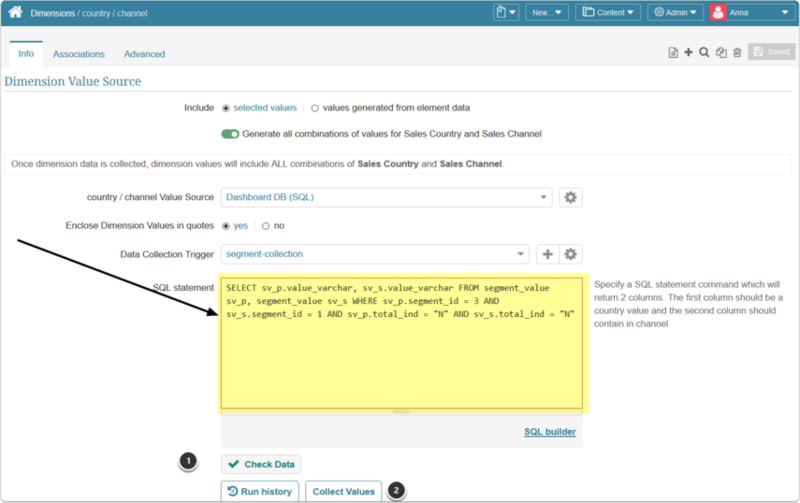 You can also provide the element content via Manual data / CSV file or via Plugin command for elements sourced from External Services. 3.2. Return to the compound dimension you have created in the first steps. .The Compound Dimension Values table should be populated with new values.